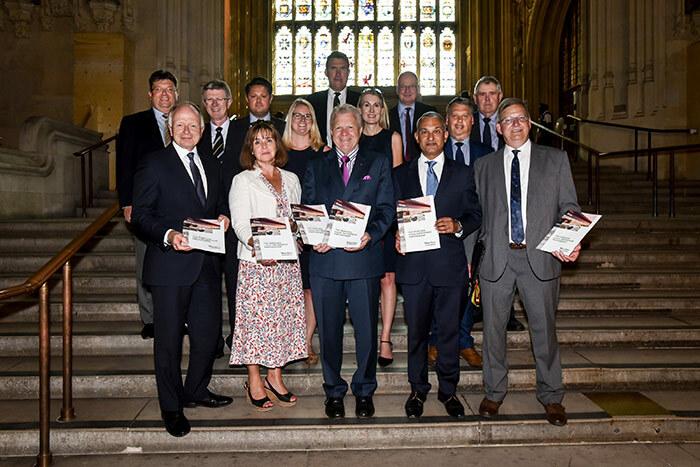 A University of Wolverhampton Deputy Vice-Chancellor joined the Marches Local Enterprise Partnership (LEP) to launch their Annual Report at Westminster recently. Professor Ian Oakes, who also chairs the Wolverhampton Business Champions, is responsible for Research and External Engagement at the University and is a former member of the Black Country LEP, a member of the Marches LEP and Chief Executive of the University of Wolverhampton Science Park. The Annual Report highlights progress to date on key infrastructure projects in Herefordshire, Shropshire and Telford & Wrekin as well as the next steps for the LEP as it embarks on consultation for its new Strategic Economic Plan. Professor Oakes said: “It was a real privilege to accompany Marches LEP board members along with local Members of Parliament to launch their Annual Report which highlights progress to date on key infrastructure projects in Herefordshire, Shropshire and Telford & Wrekin as well as the next steps for the LEP as it embarks on consultation for its new Strategic Economic Plan. LEP Board members, including the chairs of the three area business boards and representatives of the LEP’s partners, Herefordshire Council, Shropshire Council and Telford & Wrekin Council, joined Business Minister Richard Harrington MP along with Shrewsbury MP Daniel Kawcyznski, Ludlow MP Philip Dunne, North Shropshire MP Owen Paterson, Telford MP Lucy Allan and North Herefordshire MP Bill Wiggin at the event.